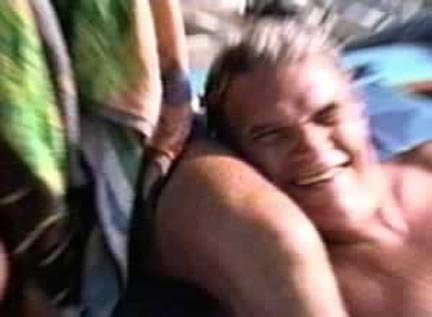 The video footage in Black Box: This is not my Father was taken on a boat trip Cynthia Greig and her father took to the island of Culebra, Puerto Rico, in 1989. The following year, on a trip to Venezuela, her father tragically died in a plane crash. The audio in this piece is a reenactment of the last few minutes of dialogue captured by the airplane’s “black box” recorder, read by actors from the original transcript. The video is two minutes long and the audio is three minutes long. Edited as a continuous loop, the relationship between the emotional, frantic audio and slow-moving, cheerful vacation footage changes with each pass. Both home videos and an airplane’s black box recorder seem to offer immediate access to the past, but Greig and Smith show truth to be more elusive. If the man’s life is represented here by the images and the moment of his death is evoked in the audio track, neither shed light on the other in the end. Instead they engage in an endless dance of momentary associations and disjunctions. By projecting the video in a darkened gallery—effectively a “black box” of its own—the artists stage a metaphorical alignment of these two black boxes, that of the doomed airplane’s recorder and the installation itself. This final gesture underscores their own mediations, and by extension the ways in which our understanding of the past is itself mediated. Cynthia Greig lives and works in Detroit. 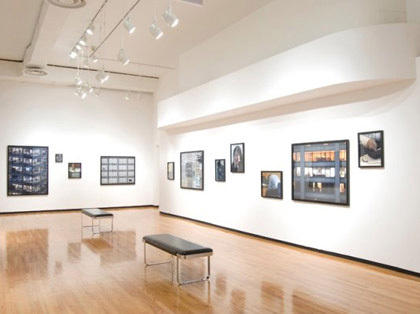 Her photographs, installations, and videos have been exhibited at San Francisco Camerawork, Houston Center for Photography, the Alternative Museum, New York, and the Urban Institute for Contemporary Art in Grand Rapids, Michigan, among other venues. She received an MFA from the University of Michigan (1995) and studied art history and filmmaking at the University of Iowa, where she earned an MA in 1988. Richard H. Smith works as a film editor in Detroit. He received his BA in film and video from Michigan State University (1985). He has edited several independent documentaries that have been exhibited at Gigantic Art Space in New York, and screened at film festivals including the Ann Arbor Film Festival and Sundance. In 2000 he received an Emmy Award for his work on Come Unto Me: The Faces of Tyree Guyton. The Museum of Contemporary Photography included _Black Box: This is not my Father_in the exhibition Relative Closeness: Photographs of Family and Friends, June 11 - August 8, 2007.